Portland Paddle offers kayak classes for all skill levels taught by American Canoe Association-certified instructors and licensed Maine Guides. Prices include the use of a kayak, though you are welcome to use your own. We recommend taking the courses in the progression listed below if you are new to kayaking, but it is fine to skip ahead if you have prior sea kayaking experience. If you have any questions about which course is best for you please call or email us. HOW TO BOOK A LESSON: Book online with a credit card using the buttons below or call 207-370-9730. Pay upfront or place a 25% deposit. This is the course to take if you are new to sea kayaking. You'll learn all the basics of the sport and leave with the skills and knowledge needed to kayak on protected seas with other paddlers. Your instructor will get your group started onshore with a brief talk about boats and gear. Then you'll get fitted into kayaks and head onto Casco Bay to learn the essential strokes of the sport. You'll take a brief paddle in Portland harbor and practice strategies for safe paddling in open waters. Your instructor will customize the lesson to work with each students' goals, experience level and interests. The level 2 class is offered the following weekend and we recommend taking the two courses together. This course builds on the skills taught in our Level 1 course. If you have some sea kayaking experience you might consider skipping Level 1 and starting here. 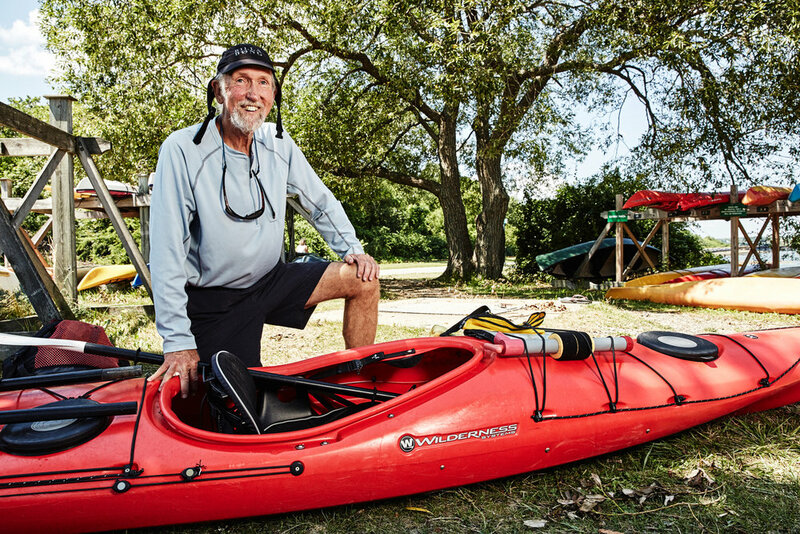 Once you're familiar with the skills covered in the Level 1 course you're ready to learn how to maneuver your kayak with greater ease and efficiency -- even when you are facing challenging conditions like strong winds or swift currents. 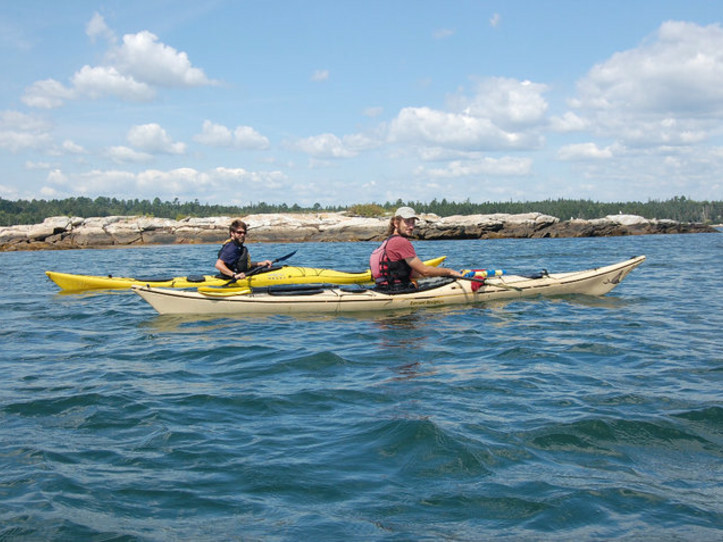 This course will help you develop better boat control and teach you how to prepare for paddling on the open waters of the Maine coast. We will paddle to a nearby island to give you some practical experience making a crossing while taking into account tides, currents and boat traffic. We'll end the course with a wet exit, which means you'll capsize your kayak to get comfortable popping out of your boat in the water. You'll leave completely ready for the next course in our progression: The Kayak Rescue Clinic, which will teach you how to reenter your kayak after a capsize. Wetsuits are provided if conditions warrant. Getting back into a kayak after a capsize is more difficult than you might expect -- but only if you're not prepared. That why it's important to be familiar with some techniques that enable you to rescue yourself and fellow paddlers if someone accidentally goes for a swim. This course, open to anyone who has sea kayaked at least once before, will give you a chance to learn and practice some of the most tried and true kayak rescues. Portland Paddle (and most sea kayaking outfitters in the U.S. and Canada) will require you to have the skills taught in this course before letting you rent a sea kayak for use on open coastal waters. As with all our courses, your instructor will customize the course to meet with each student's goals and interests. Wetsuits and all necessary gear are provided. Plan to get wet! This course is a version of our “Roughwater Rescue Clinic” designed just for SMSKN members. The five-hour course will be taught by Suzanne Blackburn. Most sea kayakers learn and practice rescue techniques in calm conditions, but when you actually need to use a rescue it's likely you'll be exposed to waves, winds and currents. This half-day training offers kayakers the opportunity to practice rescues in challenging conditions. It's also an opportunity to gain comfort paddling in roughwater. We'll venture into some areas near Richmond Island were we're sure to find breaking waves, rocky coastline and ocean swell. Instructors will build on students' knowledge of basic rescue techniques by modeling advanced or alternative methods of rescuing paddlers in rough seas. Everyone will get plenty of opportunities to practice rescues and instructors will also help students improve their roughwater boat handling. This course is appropriate for intermediate- or advanced-level paddlers. Course meets at Portland Paddle's Crescent Beach State Park location. Present your booking confirmation for free entry to the park. Please have your boat on the beach and be ready to paddle by 9:30 am. The park gate opens at 9:00 am, so we suggest you arrive then. Wetsuit or drysuit. Portland Paddle rents both wetsuits ($5) and drysuits ($20). Helmet. Portland Paddle will provide helmets for those who don’t have them. Sea kayaks can be incredibly agile, swift and responsive when they are used with proper technique. This course, designed for intermediate paddlers with basic rescue experience, introduces techniques such as bracing, edging and sculling. You'll learn to have greater control of your kayak and you'll become much more prepared for paddling in strong winds and large waves. This course, which usually has five or fewer students, is taught by Portland Paddle's most experienced ACA-certified instructors. Your instructor will also provide opportunities for you to learn about other advanced paddling skills. Sign up for all three sessions or choose to register for just one or two. Use the blue button below to register online. All sessions take place at the offices of the Maine Island Trail Association, 100 Kensington Street. 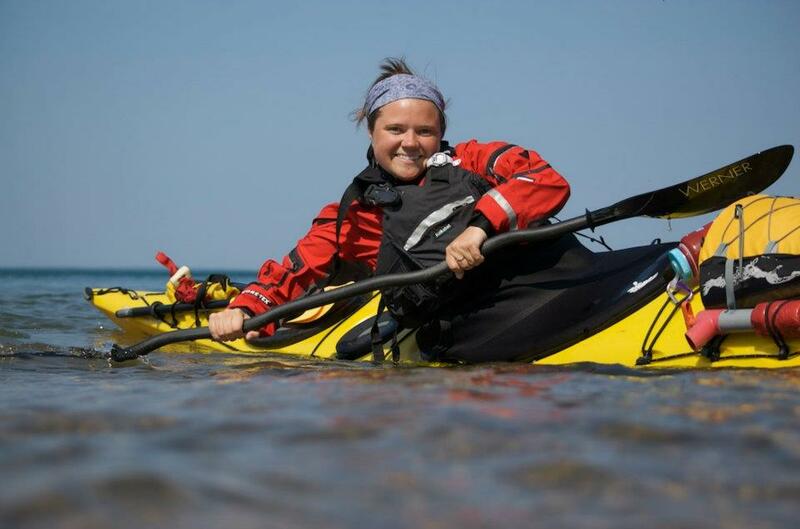 Spend a day on the water with guide Suzanne Blackburn learning and practicing some of the essential skills involved in sea kayak navigation. This course will prepare you to navigate through fog, follow the rules of the road when crossing boat channels, and use a nautical chart to plot a course. We will spend most of the day on the water getting firsthand experience with navigating in the waters near Crescent Beach State Park and Richmond Island. We will take many breaks along our route and will move at a modest pace, but all students should be prepared for a full day of paddling. Please pack a lunch. We developed this course as an on-water counterpart to our classroom Ocean Skills navigation workshop, but no prior navigation experience is required. Anyone with prior sea kayaking experience is welcome. The cost of using a kayak is included in the price, though you are also welcome to use your own. We will also provide basic navigational equipment (compasses, nautical charts, etc.) but students are encouraged to bring their own if possible. This course will teach you how to roll a kayak -- an invaluable safety skill that's also endlessly fun. We'll spend most of the time in the water mastering a series of techniques that will lead to an actual attempt at the roll. If you haven't rolled by the end of the course, you'll leave knowing what you need to do to get there. This course, which usually has five or less students, is taught by Portland Paddle's most experienced ACA-certified instructors. You'll also have an opportunity to work on other kayaking skills, such as bracing, edging and alternative self-rescues. This course is limited to students with previous experience capsizing and reentering a sea kayak. Our kayaking and SUP instructors are qualified to teach lessons covering a wide range of paddling knowledge -- from advanced skills like surfing and seamanship to more basic skills like how to choose the right vessel and how to turn your boat or board effectively. Our expert instructors are available for private lessons. A two-hour lesson, which tends to be the best length for many students, costs $110 for one student. Intermediate and advanced students can also consider a full-day lesson for $225 for one student. Please call us to learn about rates for lessons with different lengths and more than one student. We love sharing our knowledge of paddling and working individually with students to progress their skills. Join us at Riverton Pool in Portland to learn how to roll a kayak. We’ll keep the class size small so that students will have opportunities for one-on-one instruction as they attempt to master the roll. This course will teach you how to roll a kayak -- an invaluable safety skill that's also endlessly fun. We'll spend most of the time in the water mastering a series of techniques that will lead to an actual attempt at the roll. Along the way you’ll get practice in other kayaking skills and you’ll gain better control of your boat. If you haven't rolled by the end of the course, you'll leave knowing what you need to do to get there. This course is limited to students with previous experience capsizing and reentering a sea kayak. Pre-registration required; space is limited and a course minimum must be met to run. Please arrive 20 minutes early. If you are bringing your own boat drive down the fire lane and unload your boat near the pool doors behind the basketball courts. Someone will open the pool doors by 1:45 so you can carry your boat inside. Please make sure your boat is thoroughly cleaned of debris before you place it in the pool.